9 Incredible Home Gym Ideas, It’s Time For Workout ! Home gym ideas – Working out is really important to make you stay healthy. However, you might be busy with your work and the hustle and bustle of the city life so that you don’t have enough time to hit the gym. 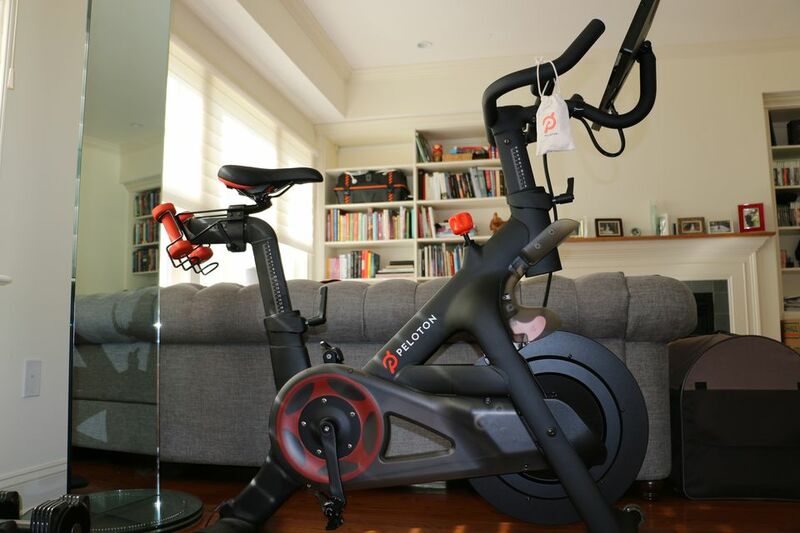 If you can’t go to the fitness center, why don’t you just bring it to your home? Here are nine incredible home gym ideas that can boost your mood to work out regularly. You go to work on the weekdays. Now you are planning to hit the gym on the weekends? Don’t you want to spend some time with your kids? It might be complicated because you want to spend some time with your kids. On the other hand, you also want to work out so that you can stay healthy. Well, you can still accompany your kids while working out at home. 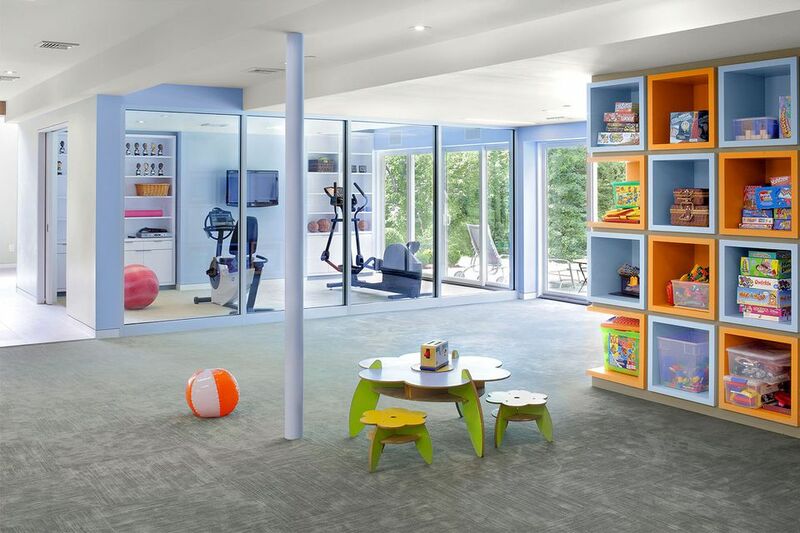 You can build a room that enables your kids to play comfortably when you are working out. The gym room must use glass partitions so that you can see your kids clearly and observe what they are doing while exercising. Pro : You can still have your family time and look after your kids while working out. Con : You will need a huge space to have both gym room and kids’ playground. We all know that working out can be arduous and exhausting sometimes. And it gets worse when there is nothing interesting to look at in the gym room. Eventually, you will be cheesed off with this workout time. Therefore, you need to alleviate it and add more fun to your workout time. Installing large windows in your gym room is such a great idea. They let the natural light spread throughout the room and lend spectacular view. Place your stationary bicycle and treadmill right in front of the window so that the landscape can be clearly visible so that working out can be less tense. The landscape of the beach has always been exquisite. It always amazes anybody who looks at it. Therefore, working out by the beach can make your workout time become the most relaxing time despite the weariness. 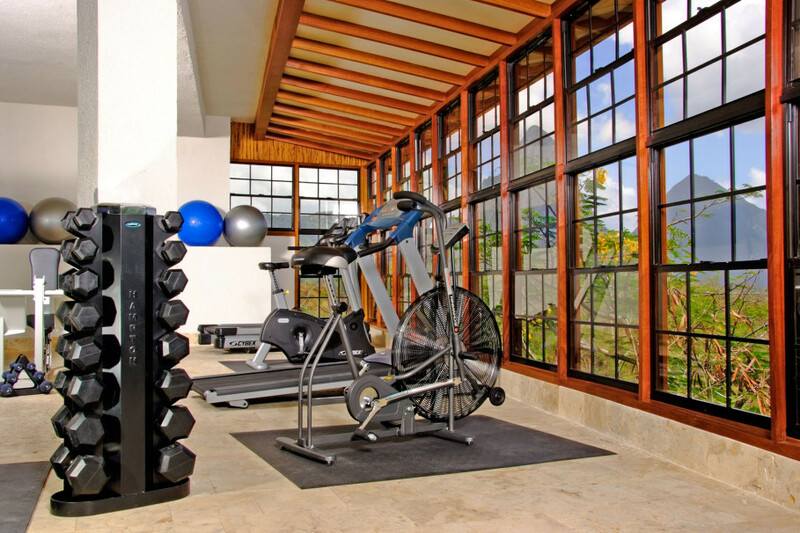 To let the spectacular view come to your sight, install some large windows in the gym room. These large windows also allow for a greater circulation of air around the room which, eventually, can get rid of damp. 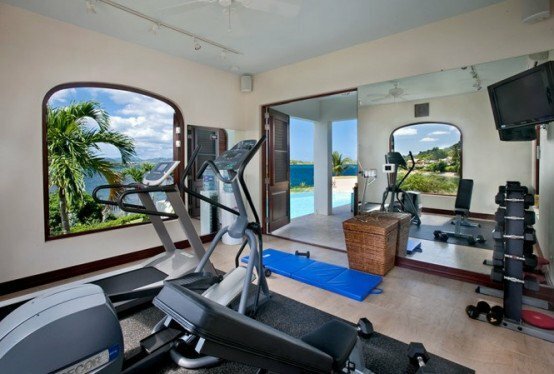 With the spectacular view and good circulation of air, you are now ready to do vigorous exercise to get in shape and improve your stamina. Finished basement can be functioned as many kinds of rooms such as game room, living room, or even gym room. Working out in the basement can give you an ultimate comfort since it is more private. You can focus on your body goal while enjoying your me-time. It is all by yourself. Isn’t it great? 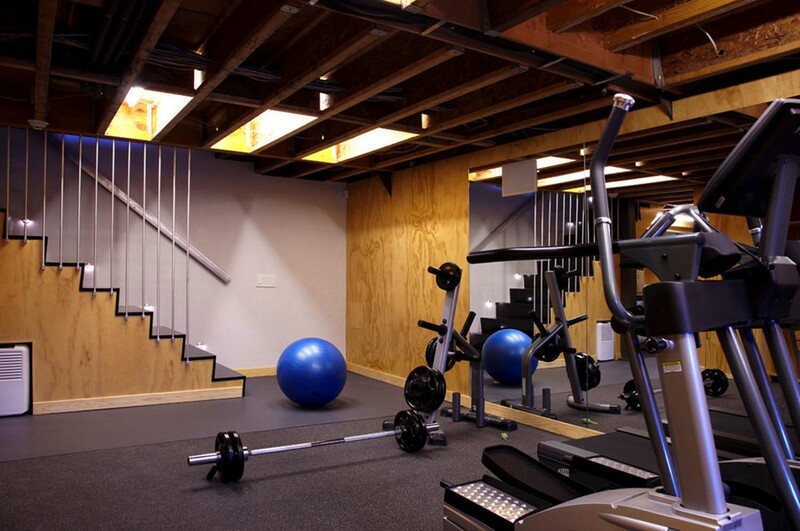 Since it is a basement, make sure that the gym room provides a good circulation of air. You can install some windows so that good air circulation can be obtained. 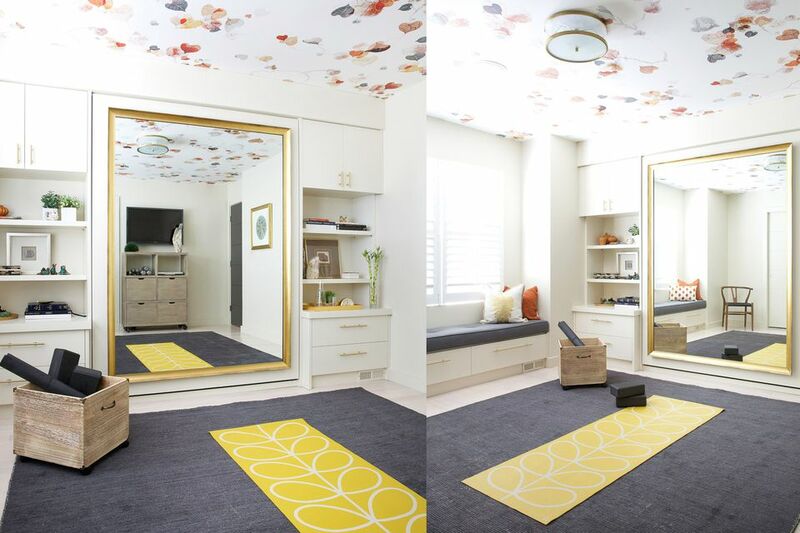 Installing a huge mirror can accentuate the room. It can also help you see your appropriate form when doing yoga. If there is not enough space to build a gym room in your house, you can always merge it with another room such as a bedroom. It will do in a pinch. But, what if there is not enough space in your bedroom? You can use some tricks to make it look bigger enough for you to work out. Shoving the furniture in your bedroom provides a quite large space in the middle of the room. Hanging a huge mirror enables you to check whether your alighnment and form are good enough. The rug enhances the appearance of this room. Besides, it can cut down on the noise created by your steps when practicing aerobics. Looking at the city landscape from a balcony is a great way to blow off steam. But you can do better than merely sitting on a bench while slurping your coffe and chewing some cookies that can absolutely make you put on some weight. Instead of snacking, working out while enjoying the city landscape is better. Put your treadmill, lat pulldown machine, and barbells on the first or second floor where you can see the city landscape easily. It will be better if you put them indoor to avoid the glare of the sun. Working out while enjoying the view has always been everyone’s favorite. Therefore, some people prefer working out outdoor to indoor. This outdoor gym room provides a spectacular landscape everywhere you look at since there is no wall that prevent you from looking at the surrounding. 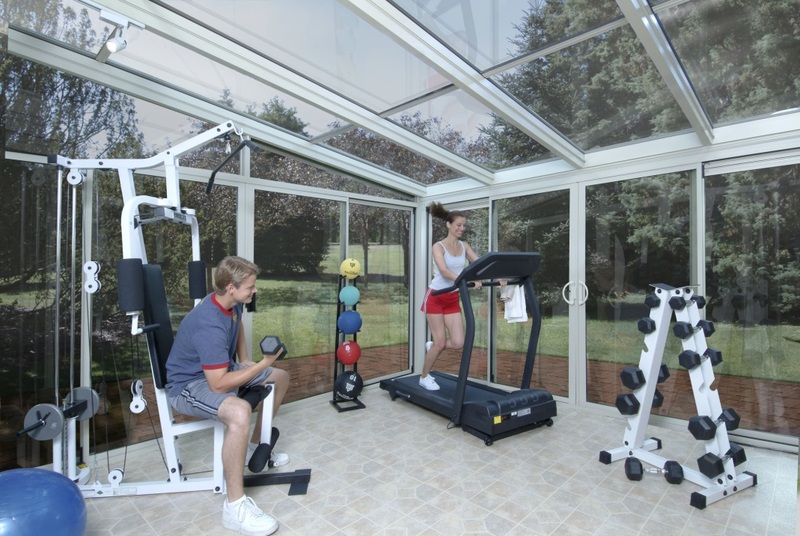 Instead of brick or wooden walls, glass walls can do a great job when it comes to outdoor gym rooms. Glass walls enable you to look at your backyard that shows a riot of colors while you are exercising. They can also prevent you from getting wet when it rains. 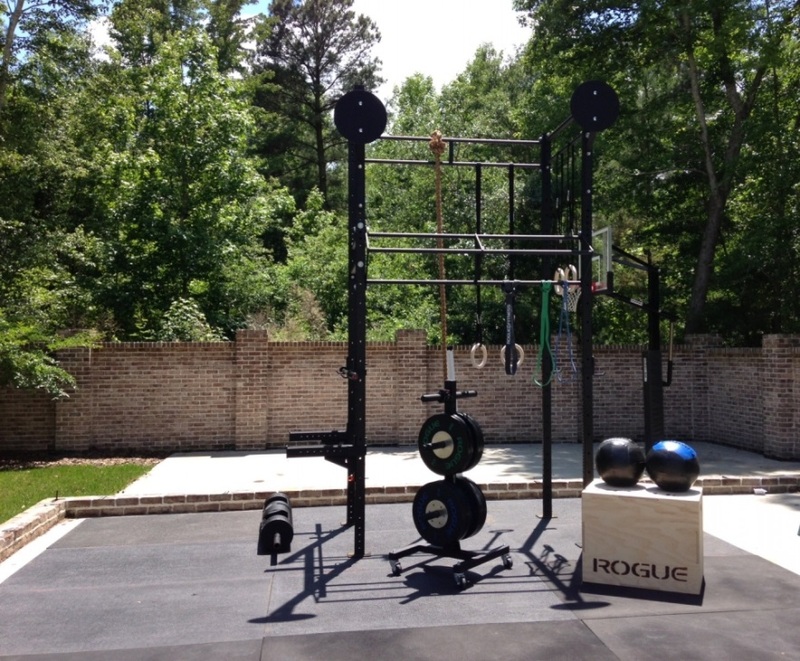 If you want to take your outdoor gym room to the next level, this outdoor home gym idea can be your great bet. Exercising outdoor enables you to enjoy the scenery and the warm of the sun. You will have a great time when working out. You will be able to enjoy the scenery when working out. You will be able to save somevmoney since you do not have to build glass walls. Since there is no wall and roof, there will be no shelter from heavy rain and the glare of the sun which can make you feel uncomfortable. Your living room can always be the best gym room in your house. Just put your stationary bicycle in your living room, and you are ready to get in shape while enjoying your favorire TV show. Now having your own gym room at home is not pie in the sky anymore. By applying one of those nine home gym ideas, you will be able to experience the best workout time ever just like what you usually have in a professional fitness center.